I discovered a great spot to do team building activities in Panglao, Bohol, Philippines in August last year. Prior to discovering White Beach in Panglao town's barangay Bolod, I usually do team building activities for my clients at Alona Beach at barangay Tawala, Panglao. Three (3) resorts in the area are owned by members of the Dumaluan clan who are natives of Panglao. These resorts are designated as Dumaluan Beach Resort 1, Dumaluan Beach Resort 2, and Dumaluan Beach Resort 3. The more luxurious of these three resorts is the Dumaluan Beach Resort 2. It was where I facilitated team building activities for an international non-government organization in August 2016. During my first visit to Bohol this year, we were taken by our hosts to the Dumaluan Beach Resort 1, the first of the three resorts owned by a member of the Dumaluan clan. I was with a group of bloggers from the #CBCTravelNation for the Seas The Day Bohol Tour package arranged through the Empty Nest Vacation Home. The bloggers were given an opportunity to interview Lola Mayang, the matriarch of the Dumaluan clan. Lola Mayang narrated how the resort started as a single hut used only for family gatherings in the 1970's. More huts were built over time as the family grew. The commercial operations of the resort only started in the middle of the 80's. The Dumaluan Beach Resort 1 currently has eighteen (18) bedrooms. Newer and bigger rooms are under construction and should be completed in time for the summer of 2017. We were allowed to use some of the newer rooms that were recently completed. These rooms are spacious and can cater to families who wish to stay at the resort overnight. Forty (40) cottages or picnic sheds by the beach can be rented night or day. A volleyball court is available for those who wish to break a sweat. The wide expanse of the White Beach can also be utilized by those who wish to play Frisbee and other beach games. The Bohol Paddlers' Association Inc. (BPAi) also finds it's home at the Dumaluan Beach Resort 1. The BPAi president is a scion of the Dumaluan clan, Dr. Theodore "Doyet" Dumaluan. It was actually a BPAi member who conducted the kayaking clinic for the Cebu-based travel bloggers during our visit at the resort. 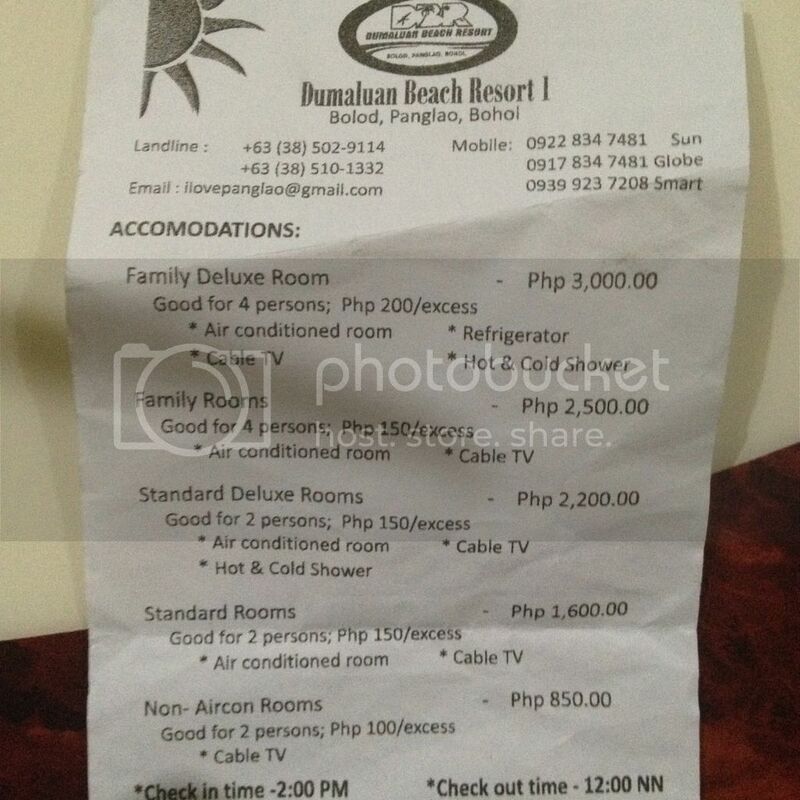 The Dumaluan Beach Resort 1 is one of the beach resorts in Panglao that have not succumbed to the over-commercialization of the popular tourist destination. Entrance fee to the resort is only PhP 25. Senior citizens and children below 13 years old pay only PhP 10. Cottage rentals start at PhP 225. The cheapest room sells for PhP 850. Refer to the photos below for the tariff rates. All three (3) of the Dumaluan beach resorts are located on White Beach, sitio Sapa, barangay Bolod, Panglao town on Panglao Island, Bohol, Philippines. The Dumaluan Beach Resort 1 is right in between the two other Dumaluan-owned resorts.